Christine “Chris” Monteith is a Licensed Clinical Social Worker (LCSW) and Licensed Alcohol, Drug, and Mental Health Counselor (LADC/MH) in private practice at Strength of Mind. After spending many years in the corporate world, she felt called to something greater, and sought a means of helping others. Chris received her bachelor’s degree in social work at Oral Roberts University and immediately pursued her master’s degree in social work at the University of Oklahoma. Once her master’s degree was completed, she began working for the agency where she finished her internship. While there, Chris worked with a range of disorders including individuals suffering with depression, anxiety, PTSD, personality disorders, co-occurring disorders, and some struggling with varying degrees of psychosis. She also worked with those struggling with emotional dysregulation as a whole, which occurs throughout many different diagnoses. Chris was excited about the opportunity to continue serving those in need at Strength of Mind where she could help individuals focus on healing from a whole-person perspective. She feels her experience working with many diagnoses has prepared her to provide ongoing care to men and women suffering with mental health issues, some of whom develop negative coping responses when they feel at a loss to manage symptoms in other ways. Chris believes in a strengths-based approach, while also utilizing mindfulness techniques, which empower clients and provide a means of non-judgmental support. Chris utilizes a variety of therapeutic approaches including cognitive behavioral therapy, motivational interviewing, and dialectical behavioral therapy-informed care. She believes each person has inherent dignity and worth. 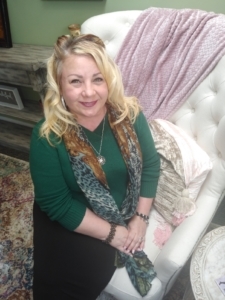 Chris utilizes therapeutic approaches to assist her clients in unlocking hope and a sense of empowerment as they move forward seeking a better overall quality of life.